How to draft a professional resume? Download this professional resume letter now and get your polished resume that will certainly impress your readers in minutes! Personal resume letter is the most significant factor to decide your interview before first sight. But how to make it excellent and perfect? 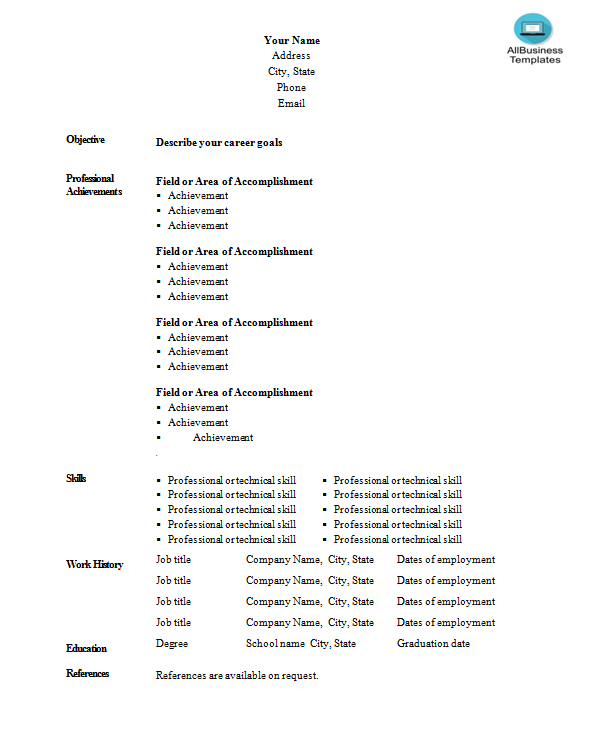 This professional resume template has ways to grab your recipients’ attention. Every essential piece of your brief resume is covered. The readers will know your experience and your ability clearly through an excellent personal resume. After downloading the resume template and filling in the blanks, you can customize every detail and appearance of your document and finish in minutes. Using our professional resume letter template guarantees you will save time, costs and efforts! Print out your resume in minutes! Just DOWNLOAD IT! It will be much easier to finish one complete personal resume! Download this Professional Resume template and after downloading you will be able to change and customize every detail and appearance and finish it in minutes.